Check the latest news in regard to National Bank of Agriculture and Rural Development. The Banking organization recently issued an advertisement relating to filling several vacant positions in the departments. Grade ‘A’ Assistant manager posts will be filled after the most eligible candidates are selected through Preliminary and Main exams to be held in the coming days. Applied candidates are advised to go through these updates before Downloading NABARD Assistant Manager Admit Card 2018 Online. 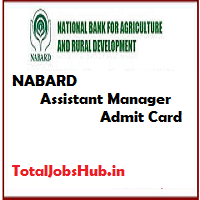 Also, please refer to the official download links to avail more information regarding your test and other selection processes about NABARD Assistant Manager Admit Card 2018 AM Pre Exam Call Letter. Get all set to have your NABARD AM Pre Exam Call Letter 2018 and attend the AM Positions test. Banking Personnel will be placed under the recruitment process conducted by National Bank of Agriculture and Rural Development this year. The authority shall place 92 news employees for the Grade-A level vacancies this year and has organized an event structure according to which the entire recruitment system is to be done. Find the relevant details here and proceed to obtain your Hall Tickets for Pre and Main test. Visit here to avail all the related details regarding the upcoming preliminary and main exam that will be taken on 12-05-2018 (Saturday) and 06-06-2018 (Wednesday) respectively. To have NABARD Assistant Manager Admit Card 2018 timely, please reach the correct web address of the site on or near 27th April 2018. Retrieve more details regarding your selection and recruitment in the subsequent sections of the page. To know the details about exam venues, Time to Report, and instructions to the examinees are listed on NABARD Assistant Manager Call Letter. For further information of the contestants, the official notification segment of the website in the career segment. Kindly, carry your Hall Ticket along with an original Id Proof to present at the entry gate of the Premises. Applicable Photo Identity Proof: Aadhaar Card, Voter ID, Passport, PAN Card, or Driving License. Use of Mobile/Smart Phones, Electronic Media (Any form), Calculators, Wrist Watches, or irrelevant stationery items are not allowed inside the examination halls/premises. Examinees are instructed to reach the venue at least 30 minutes before the test, latecomers are denied entry after the deadline. Log on to the main web address of the organization given by, “www.nabard.org” and point to the “Careers” segment on the homepage. After landing on the career section, locate an exam-related link that states Hall Ticket/Call Letter/Admit Card and follow it. Get to the Candidate’s Login Page and type your Registration Number along with Password, or Date of Birth. Hit the submit button and avail a copy of your Entry ticket. Keep a separate copy of your ticket in case of or future reference. To gain access to your NABARD Assistant Manager Prelims Exam Call Letter, kindly reach down to the official link provided at the end. For further information concerning to the examinations and the rest of the selection process, refer to the comments box and leave your message there. TotalJobshub is happy to help.